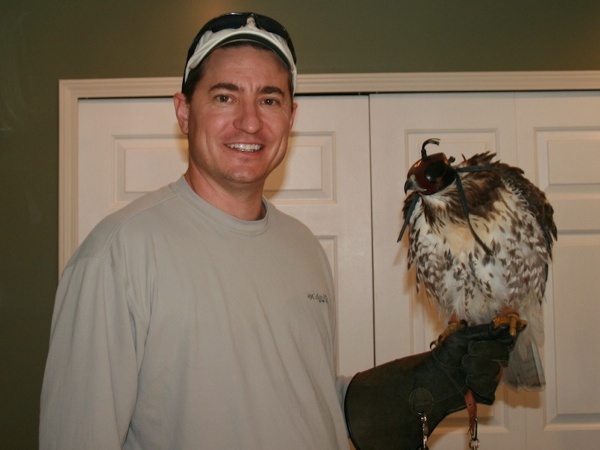 Trapping can be one of the most exciting aspects of falconry. 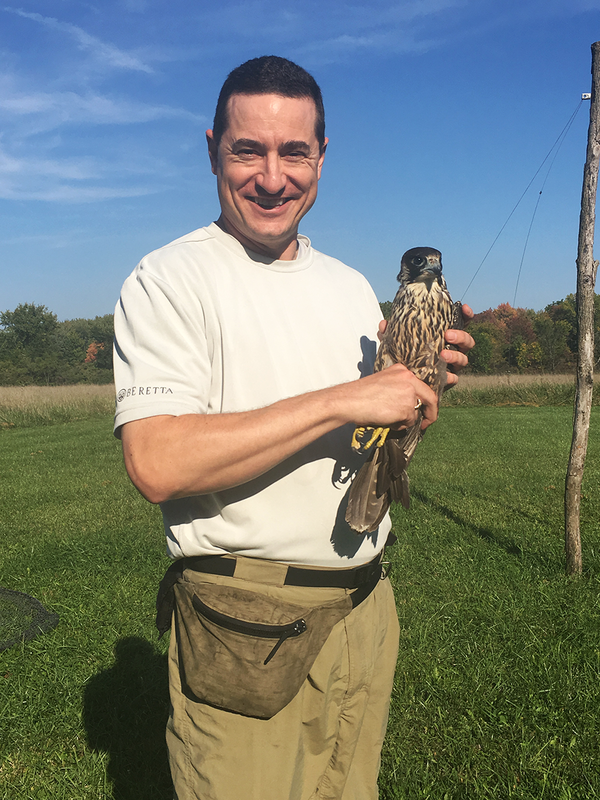 It’s an exciting time to trap and train your new hawk for the new falconry season, but the excitement and adrenaline rush as you race to rescue that hawk from the trap after waiting ten minutes (or longer in some cases) for that Immy to come down to the trap off that pole is highly energizing. So, after carefully watching a bird on a post for 20 minutes look down on the trap, but not come down to it, I gave up. I drove over to another area, and then came back to the first bird I saw, she had moved over to a taller tower. By this time, she was hungrier than earlier that morning, and when I threw out the trap the second time, turned the car around, she was coming down to the trap and got herself stuck. 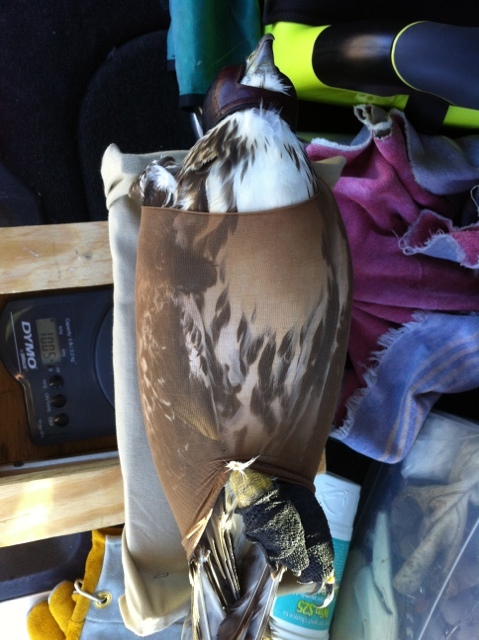 Here is the picture of the hawk wrapped up for first wieght. My third trapping adventure started out on Sunday morning a little late, but I joined my sponsor for an early morning outing anyway. We decided to drive East again, as it’s much easier to see birds out there. We checked out a few local east-facing woods before hitting the freeway. We served once close to a ramp, but were unsuccessful at trapping that bird. A few minutes later, we were back driving eastbound on M-59. 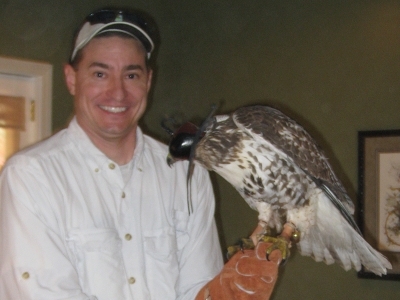 Trapping Hawks, much like hunting is mostly dependent upon being in the right place at the right time. There is some skill in choosing weather, time of day, and location, but still the most deciding factor is luck. I drove many back roads on Friday afternoon / evening, saw 12 Red-Tails and successfully trapped two of them. Upon weigh-in, they didn’t quite meet the weight requirement, so I enjoyed setting them free once again after careful inspection and a light dusting of poultry dust. Our next serve turned out to be a great trapping location off M-59. We did a quick turn out to verify an Immature Bird, and after 2 seconds with the field glasses on her, I said “Immy – GO!” There she was, sitting in the sun on a snag, facing east with a meadow/field under her to watch for tasty mice frolicking in the tall grass. She was a big beautiful immy, and might have appeared so with the sun on her, puffing feathers out for maximum warmth. We did a quick turn-around and looked for a good way to serve the trap. Luckily there was a dirt driveway that we turned into off the main road and we were able to serve out the window quickly and quietly as we bumped along the potholes. Amazingly enough, the immy didn’t bump and seemed quite tolerant of cars. By the time we turned around, the bird was gone. Where did she go? She had bolted from her perch and hit the trap hard. I raced up with a towel and noticed a large bird with tremendous feet; I covered her up quickly as she scurried to the best of her ability but failed to get away. I started shaking, getting hopeful for a big bird; her size was bigger than what I had trapped earlier in the weekend and the feet were noticeably bigger. 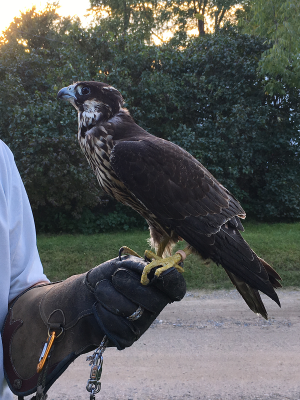 We quickly re-located her to the car to get the nooses off her talons as she was quite tangled up. After taping her feet up, hooding and socking, she weighed in at 40 oz. Perfect! We drove around for another hour looking for more immys and found one on a back road and served the trap. After ten minutes of no sign of movement, we picked up the trap and headed home for jessing and dressing. After trapping my second bird on a Sunday morning, I’m absolutely *convinced* 😉 that mornings are better trapping times. You can find birds sitting comfy in the sun somewhere, still warming up and waking up, much like I have observed my previous birds in the mews. There is a window that faces east and they regularly would sit in that window and catch the early morning sun. I named her Sable for no particular reason, I just liked the name. ** Please leave a comment! I’m interested in hearing other trapping stories either successful or ‘educational’. Trap: Hit quickly; by the time we had the car turned around, she was down off her perch. So I’m combining a little internet humor* (meme) with some falconry adventures today in order to warn all the hawks out there that I’m looking for YOU. 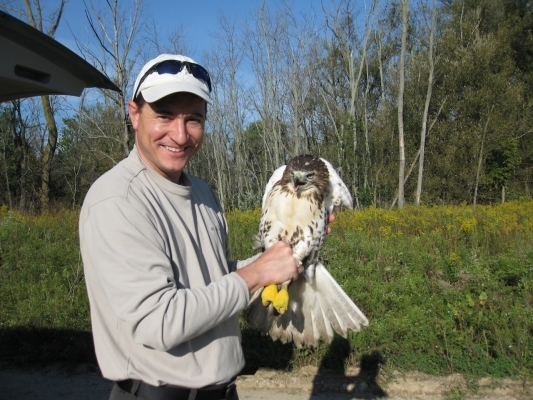 Specifically, I’m looking for a large immature female Red-Tailed Hawk. I’ve been out for three trapping adventures so far with little success. 4 adults sighted and no immys for the first adventure; 12 hawks sighted on the second attempt with two birds trapped. The night was looking like a success until the weigh-in occurred. There is a special hawk out there, the one that will be my partner for the next 6 months at least. Trapping is quite simply the process of capturing a wild hawk for use in falconry. 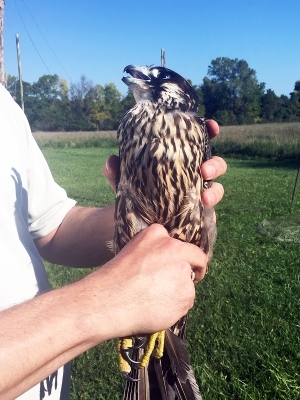 It involves a special trap**, a live bait animal, and some additional equipment for caring for the freshly trapped raptor. It also involves lots of driving. You drive around until you see a hawk that you can trap, and then you try to figure out the best way to present the trap to the raptor so she can see it, and then you are potentially waiting (long periods) for them to hit the trap. Just as long as you don’t ‘bump’ them off of their perch. Once you trap the hawk there are a few things to take care of; mainly, immobilize the bird so it doesn’t hurt you or itself. Grab the feet with gloves on, throw a towel over the bird so that she can’t see what’s going on. Then hood the bird as soon as possible. Unhook the nooses off the hawk feet carefully, this is where an injury can occur so sometimes it’s a good idea to simply cut the nooses off the feet. You’ll then have to re-noose your trap at the end of the day. It’s also a good idea to apply some ‘poultry-dust’ to a bird to get rid of parasites and insects. 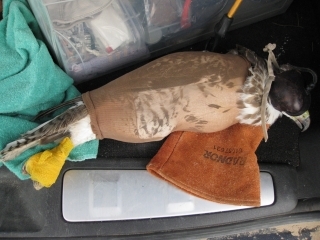 Tape up the feet with stretchy co-flex tape and then slide a sock over the bird to keep its wings under control. Once you’ve done these things you have a bird that looks like the picture below. You are now ready to get weight. Carefully place your bird on a scale and get some weight. Now it’s important to examine the bird for any other injuries, diseases, condition of the feet, or issues that would prevent this bird from making a good falconry hawk. So, you’ve got a decision to make; will you keep the bird or let it go and look for a bigger one? It’s a tough call for sure; you’ve been driving around for hours and this is the first Immy you’ve seen, let alone been able to trap one. My favorite part is letting the bird go after undoing all the dressings and the hood. You’ve given the bird a little help with the poultry dust and it’s great to watch them fly back to their home. Very satisfying to me. Drop a comment on this article if you think I missed some important details or would like to share your hawk trapping adventures! 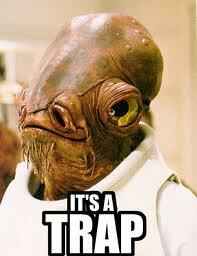 *Ackbar trap graphic borrowed randomly from the ‘net. 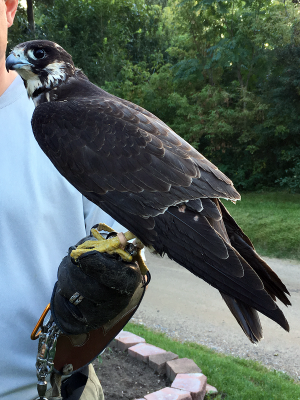 ** Detailed hawk trap pictures or construction plans are not found here due to trade secret reasons. It took a week for Tahoe to respond to food reward, but she ate a chipmunk on the 6th night after trapping. With a trap weight of 1147g, and a response weight of 1030g, we are on to the next step of training: Step to the glove. This is one of the most critical times in the training, getting your hawk to respond to you and your glove. More importantly, it’s necessary for the raptor to know what to do when you enter the Mews, to take her up for training, or out for Hunting! On to the next training lesson!